From Zdiar I took a little bus to Zakopane, another ski town in the Tatras, this time on the Polish side. 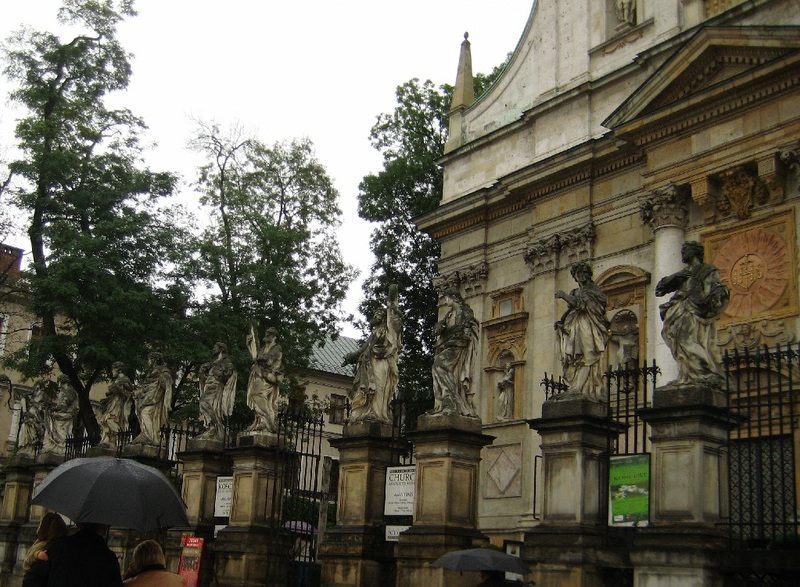 I was en route to Krakow, Poland’s cultural center, a place I never expected to visit. 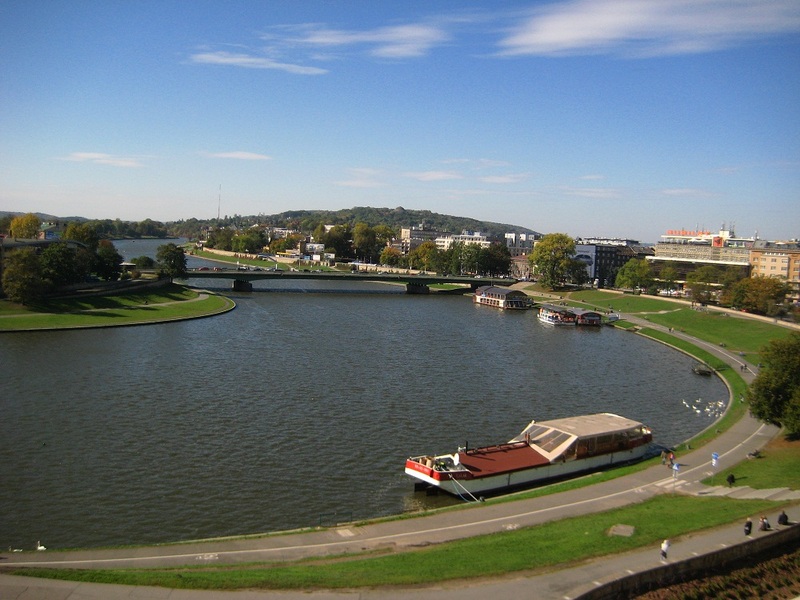 Everyone told me they liked Krakow; it was some people’s favorite city. It wasn’t big. With no data or otherwise plan for Poland I decided to walk around until I found a hostel again. Krakow wasn’t small. Soon I was mooching free WiFi in a café and back on hostelworld, a site I’d avoided for so long, until I found a place in the Old Town. But, I hated it after a night and while wandering stumbled into another hostel; I had a good feeling about its bright blue and yellow paint and walked inside right then to book the rest of my nights. It was much better, but had no more than ten guests; fewer people were backpacking now that it was October. Krakow was packed for that one weekend, but only because all of France seemed to fly out for a getaway, as England had done to Bratislava. Krakow definitely had a stricter, colder feel to it, the most marked example being that you couldn’t drink alcohol outside. People on the streets have a very cool, almost skeptical demeanor; police are a more prominent presence. This was a departure from the laid back, free attitudes I was used to. Krakow felt almost Western – but I took this as a mark of being closer to Russia, farther from the Balkans. 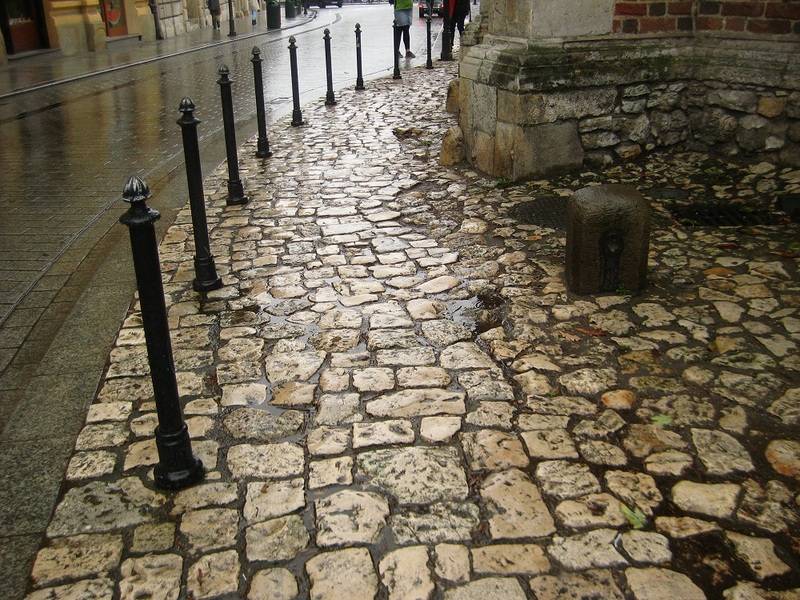 In spite of this, Krakow was one of my top cities. I had no idea how old it is, how steeped in lore: it’s said to have been founded in the 7th century above a cave home to a dragon that many knights failed to defeat until a mythical ruler named Krakus killed it with a poisoned lamb. The symbol of Krakow is a dragon, and you see all sorts of dragon and knight kitsch in carts around the castle, which I found charming rather than repulsive because I like the content. The Old Town felt like it had just undergone a speeded up process of becoming commercial that made it feel especially inauthentic, but I did find some good places there: a 24 hour pierogi restaurant, a decent underground bar, a nice bookstore café, and the beautiful and tiny St. Giles’ Church at the corner right across from Wawel Castle. It also saw a lot of Cracovians passing through. In one of the many underground bars, I discovered that Polish beer is watered down and too sweet, but good Polish vodka is amazing even if you claim to hate vodka. It has no flavor, but is pure warmth without burn that settles like a golden glow in the middle of your chest. Someday, I would like to test its effectiveness on a Polish Winter (but fun fact – Krakow has a warmer winter than the rest of Poland). My first day I spent all afternoon walking around the Old Town and had no clue what was where or where I was as I walked along the Vistula River come evening. 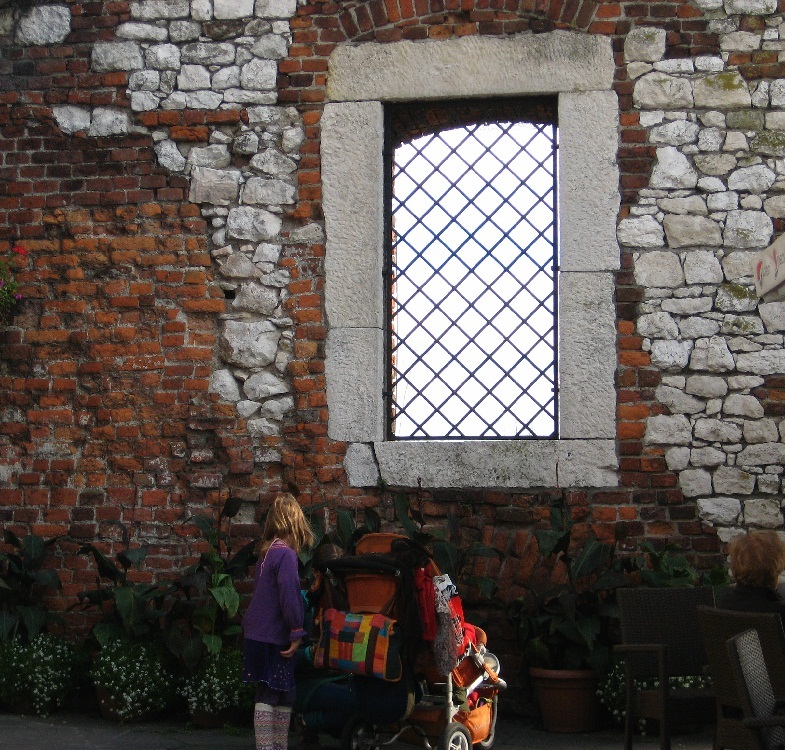 All I knew was no matter where I went the walls of Wawel Castle were behind me. Vistla River. One of the best city river walks. The path is nearly level with the river and a wonderful walk made better by a warm, clear night. People were sitting all along the hill that led up to the castle. I don’t know if I walked in on something or if this was a typical Saturday; they set off hundreds of Chinese lanterns, rising over the river and lighting up the night. Some landed in the water, many crashed into buildings, a couple merely flopped over on the ground every time their owners tried to set them aloft. What is the secret to a successful Chinese lantern I do not know. By the time I got to the intersection, it appeared I had walked into something, as many people were dressed for a formal event, mixed in with the casual crowd enjoying the warm night air with their feet dangling off the walls. In the pedestrian tunnel below I found a rather swanky looking bookshop and café and felt slightly out of place with my mismatched outfit and clear intentions of not buying anything. It might have been an art gallery, too. 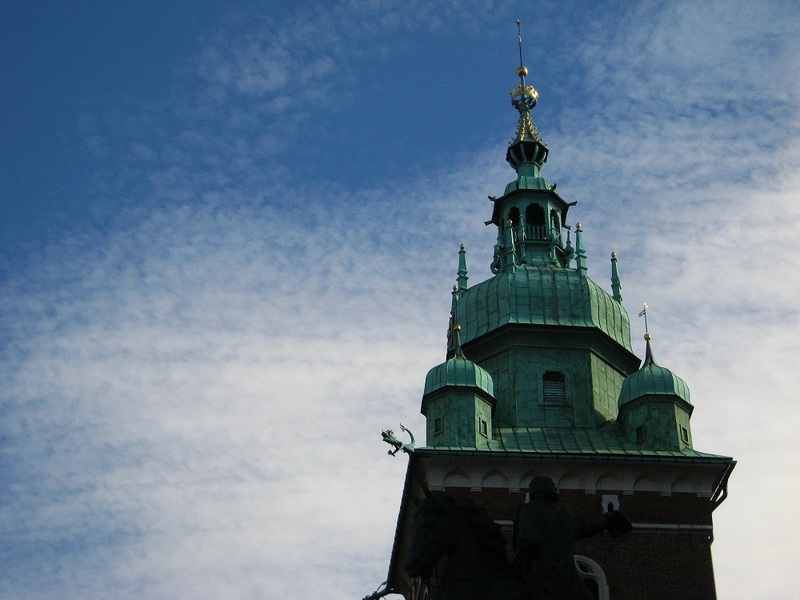 One of my favorite places was Wawel Castle. 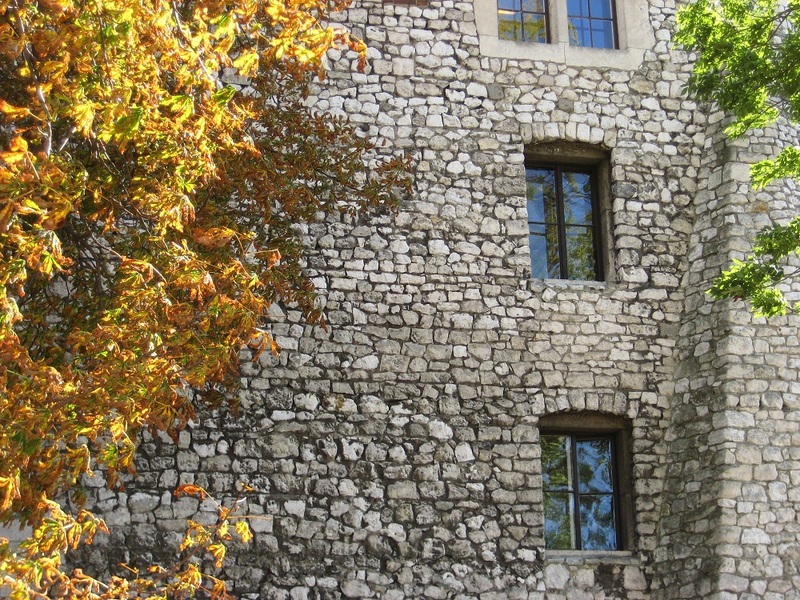 It’s the most beautiful castle complex I visited, a composite of different colored walls and architectural styles from the 4th century to the Renaissance. 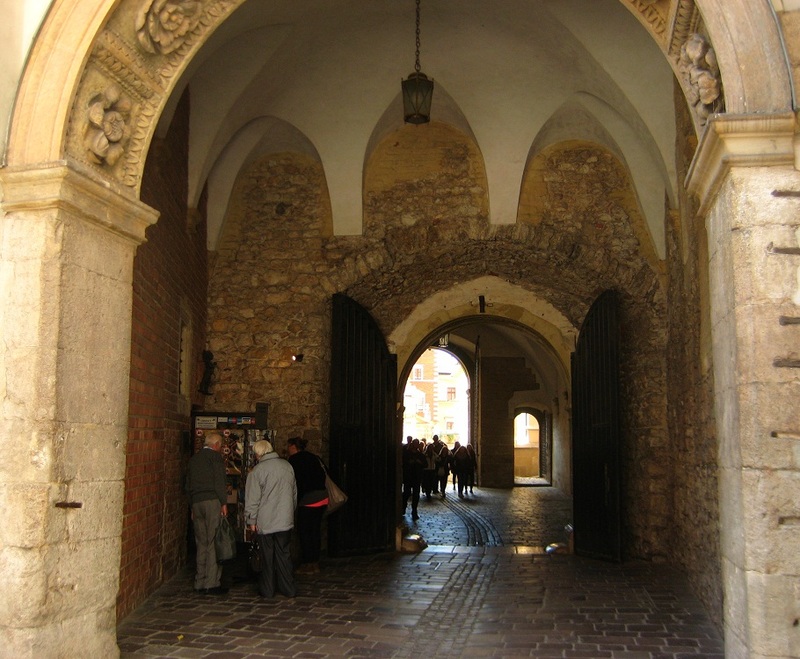 Here you discover how deeply Krakow is entrenched in medieval culture: stone walls, hanging lamps, latticework, stained glass windows, towers, and a legendary dragon that invited Trogdor jokes from the people I toured with. 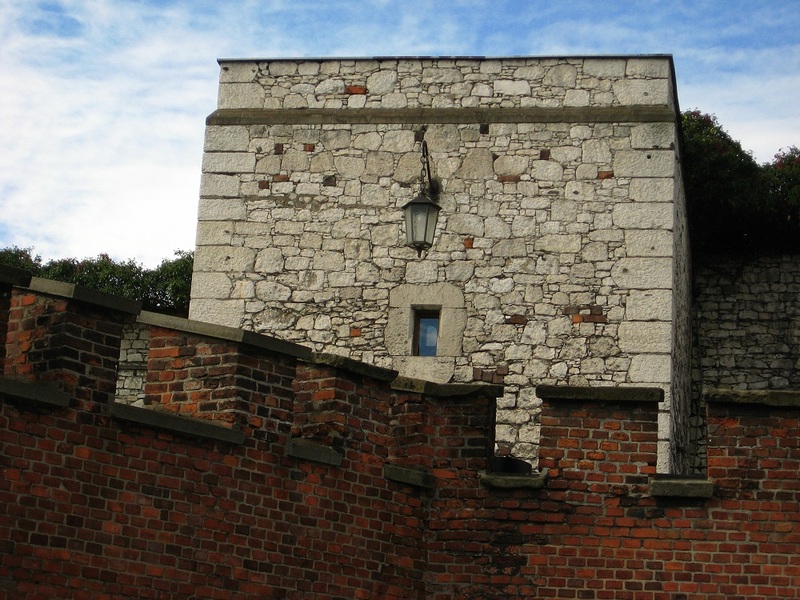 At the top of the hill, the remains of Krakow’s original settlement sit in the middle, low broken-down stone walls that were once the village. 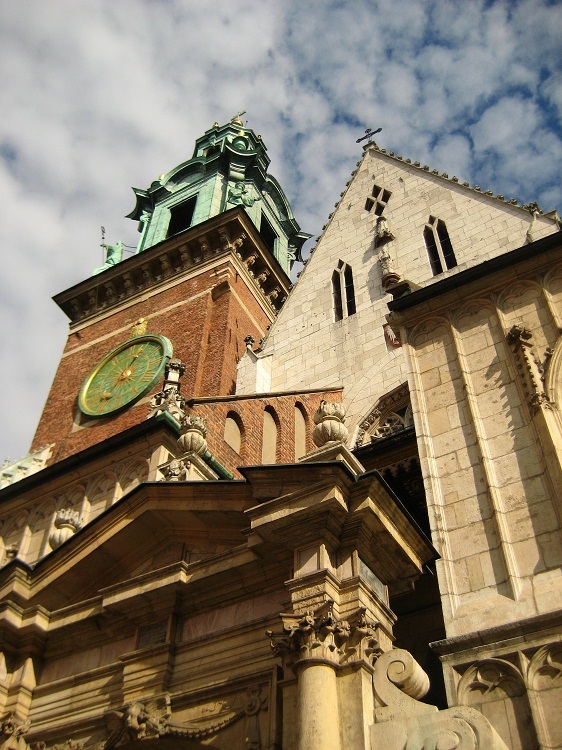 Residential buildings surround it on the river side – yes, there are people who live in Wawel Castle. 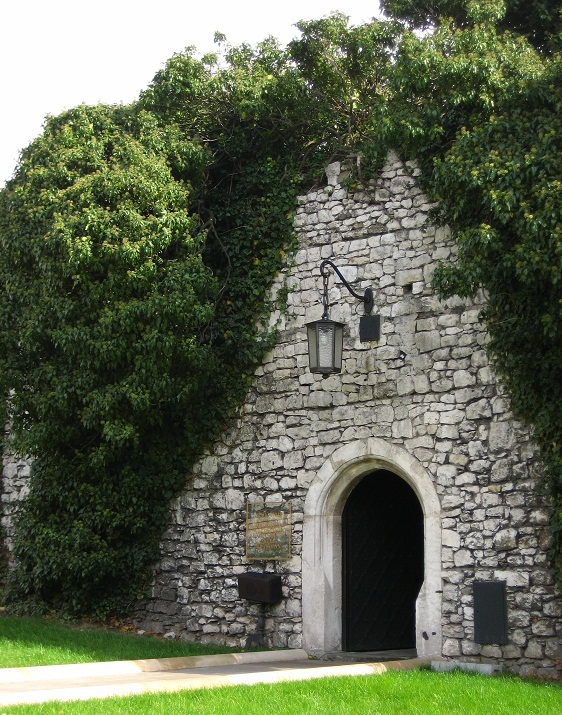 I saw one old lady turning keys to go inside this rose covered wall as I sat atop some stairs exploring a another medieval looking door that turned out to be locked. All of the residents on Wawel Hill are government employees. While touring the perimeter I found a tiny music shop buried inside the old wall under a curtain of ivy. 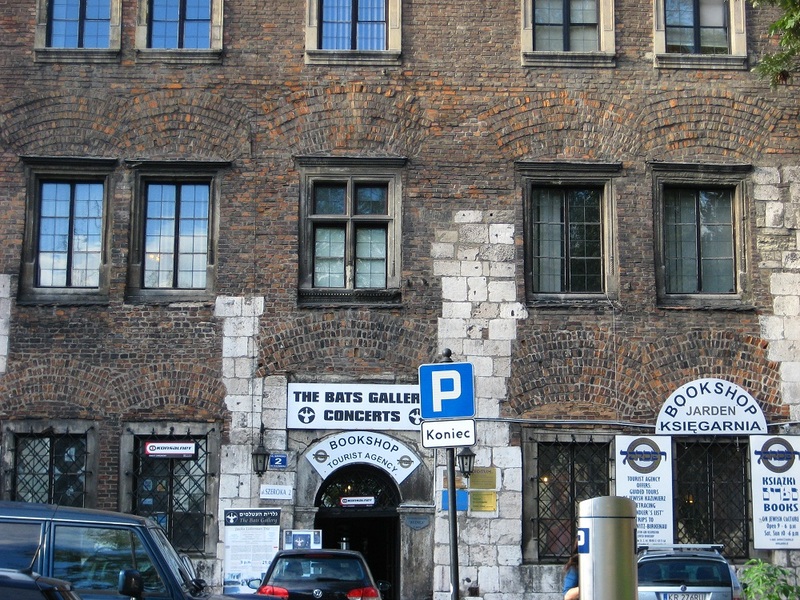 It seemed so random; with its faux stained glass ornament of Wawel hanging against the window, I expected medieval lute or chamber music, but the CD rack sold dusty copies of 90’s and early 2000’s Irish rock songs. I can’t help but think – and I should never be in charge of preserving historic sites – it would make a wonderful little café. Yes, I would probably convert every medieval corner I got my hands on into a low-key café or pub with carefully selected books and music so rare you couldn’t find it on YouTube. Under the umbrella of my ownership, each one would have a different name and website layout to give it the appearance of a local business. I would, of course, hand over ownership to one of the locals once the place got off the ground – or should I say, underground. Ultimately the collective would bring down Starbucks. Wawel was such a cool place that for once I paid to tour some of it. I picked the two cheapest options, but I’m convinced without experiencing the others that they were the best. 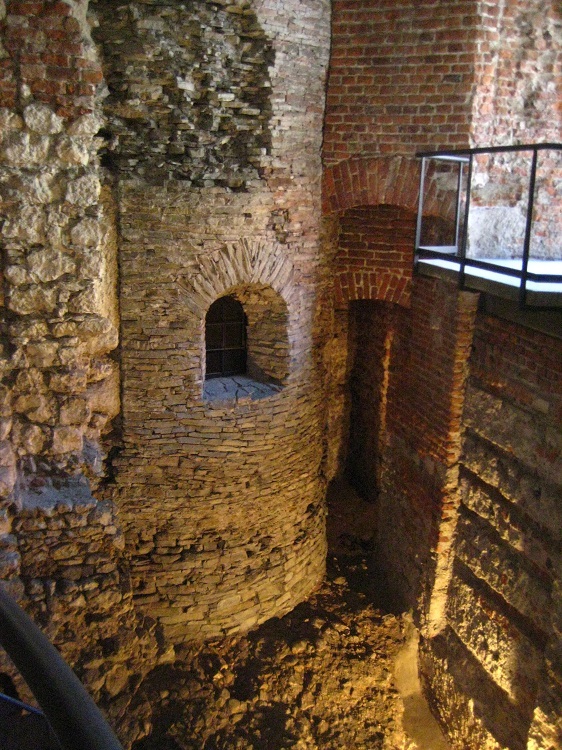 First was “Old Wawel,” a walk through the castle’s very extensive partially unearthed ruins. Next was the Dragon’s Den, a tour through an actual dungeon that takes you through the hill to the bottom of the castle out to the fire breathing dragon sculpture. Except I didn’t realize this and hadn’t wanted to leave the castle yet, so back up I went, past more towers. 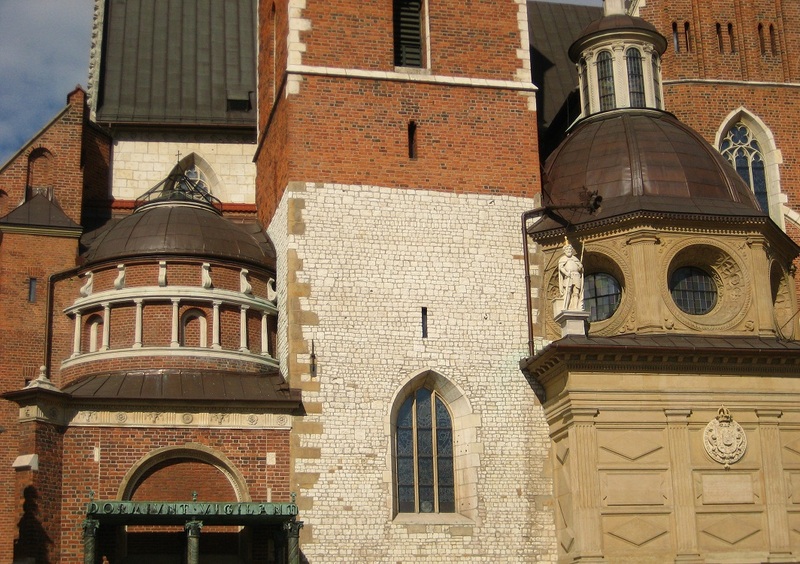 The highlight of the whole thing is Wawel Cathedral, a multicolored cornucopia of chapels and little domes smushed together, each covered in the details unique to the time period they were built in. After an entire afternoon of eye candy, history, and culture that I had to tear myself away from, I would highly recommend Wawel Castle. Krakow saw some ugly weather in my time there, and a couple nights were spent drinking beer in the hostel’s downstairs bar with the few other guests. One of them was a middle aged busker from the UK on a saxophone who told everyone at breakfast the unsolicited story about how he had given up money. 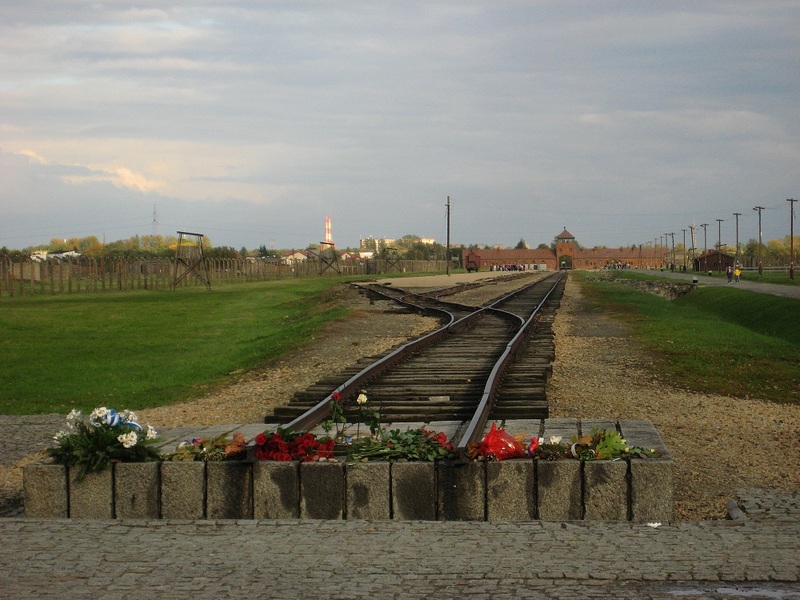 A couple other guys, including the only Miker I will likely meet, and I decided to go to nearby Auschwitz-Birkenau the next day. Picking us up in the morning was the toughest looking Polish man I’d yet seen, daunting from profile view, but proving to have the constitution of a lapping dog when he turned around toward us. He wasn’t much for talking, but didn’t mind my claiming shotgun as the rest of the group – the guys I came with and two older men from Denmark – piled in the back. By contrast, I finally found where all the small women of Europe concentrate. 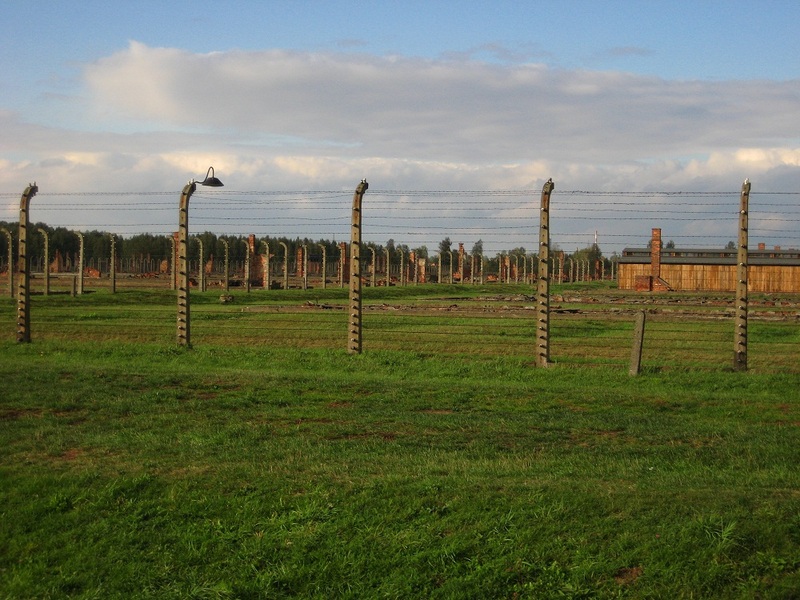 I’d felt dwarfed by the Danish and German, stocky next to Hungarians and Czechs, but Auschwitz was the touring ground of school groups of Polish women all my height. I felt at home among my people. It’s disturbing but undeniable that a feeling of peace and stillness pervades the former concentration camps. Plaques and relics hang about, and displays of the hair, shoes, brushes, and suitcases of the victims from all the clean-swept corners are gathered and put behind glass. Somebody told me they lost it when they got to the hair. To me it felt like a museum, disconnected from its history. The video we watched on the way there, with interviews and video clips, was much more emotionally stirring. What surprised me was that the bunkers’ interiors looked like a public school. Linoleum floors and simple, black railings along the stairs. Many of the stairs are heavily worn down and caved in the middle. If you think about that… that’s the disturbing bit. I wondered if they would dare to place a café or souvenir shop on the grounds. There was a small coffee stand at the entrance, but a grotesque distortion ran through my head of passing someone in the middle of the tour standing behind a counter selling magnets or, perhaps more tastefully, historical books. I was surprised – we all were – to find a refreshment stand outside bunker no. 8, the one open to the public. My last day in Krakow, I took the free walking tour of Kazimierz, the historically Jewish district from the 14th century until WWII, where Jews and Christians lived peacefully side by side for most of that time. 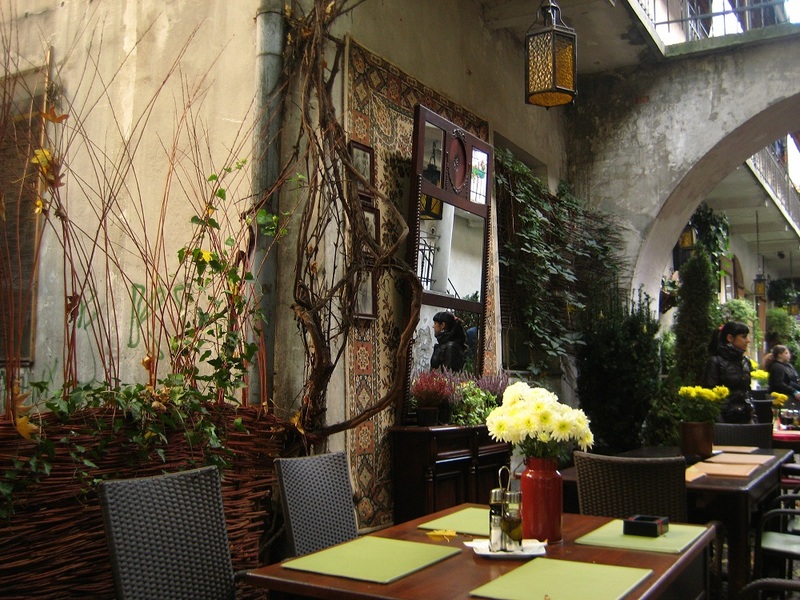 In recent years it’s seen a revival of Jewish culture, and you find many Jewish restaurants on the streets. One of my regrets is not stopping for latkes somewhere. 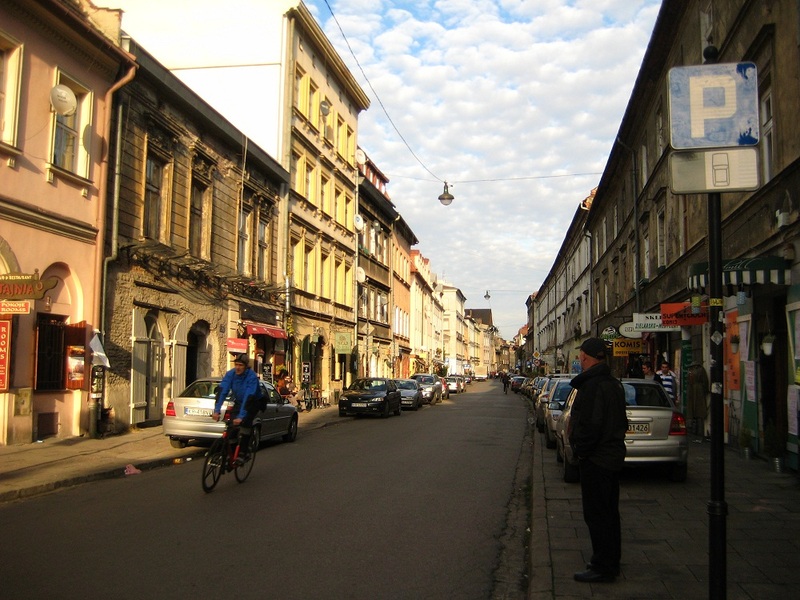 Kazimierz might have been my favorite district in Europe. It’s now the place with the best bars, art galleries, restaurants, and cafes in Krakow, and to go along with this it’s as rundown looking as it should be. Another of my regrets is spending only one night there. 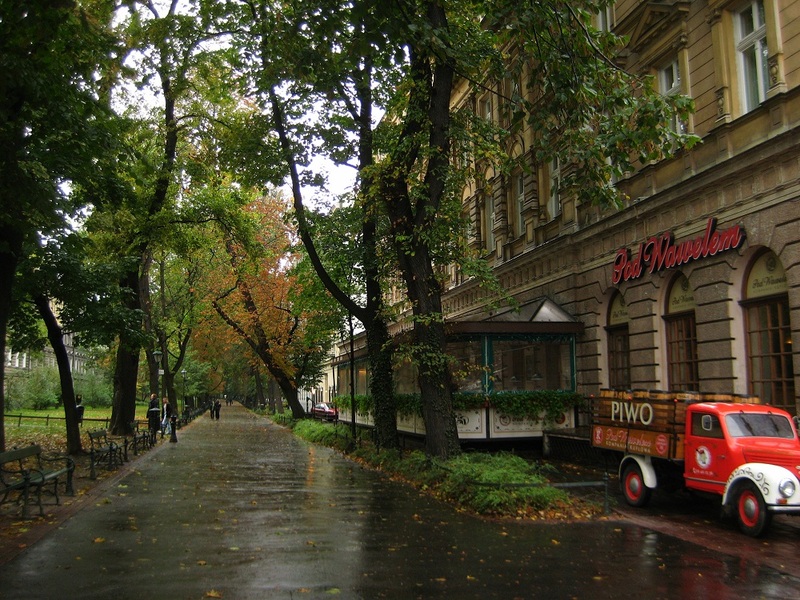 Estery Ulica is the street you want to start on. It begins in a courtyard with a daily flea market and cheap, good stall food open into the morning hours. At that corner is Alchemia, a recommended bar with that old world bohemian ambiance of wooden tables and halfway melted candles. But when I asked the tour guide where I should go, she waved vaguely to everywhere and said, “just walk around.” When I stopped by Alchemia later, I found it nearly empty and the sheer number of melted candles overdone. So I walked on home, now in search of an en route traditional milk bar, which I can’t tell you any more about since it was closed. Whether it was along the river, in Planty Park that surrounds the Old Town where the medieval walls once stood, or through winding Kazimierz, I felt quite safe walking around Krakow on my own at night, so on a whim I made a sharp turn down a little side street at the edge of Kazimierz. It seemed to draw out Krakow’s gamer crowd. I’m hardly a gamer, but when I saw a group of young Polish guys playing cards!, well, I thought of approaching them but ultimately didn’t. Young Polish men seem to be unanimously fond of growing their hair out to the middle of their backs, and it always comes out very straight and dirty blonde, except for the especially charismatic guy of this comically quirky crowd who had curly brown hair and a fedora. Even though they dropped a lot of American English phrases, the language barrier was still daunting. I watched a Polish movie once, Nóz w wodzie (Knife in the Water), and it was a headache to adjust to the Polish pronunciation of things. The words are analagous enough to Russian, but when spoken rapidly… there’s no keeping up for an unpracticed ear. By the time I thought to ask what they were playing anyway, they’d finished and disbanded. Soon, however, another group sat down at the recently emptied round table next to me and opened Battlestar Galactica. I’d never played but I recognized the name! It’s my last night out in Europe, what the hell, I thought and asked them if they spoke English, and then if i could join them. It was probably around Monopoly level and I could just pick up as we went along, I assumed. Truths were successively revealed, the first of which was that Battlestar Galactica is nothing like Monopoly but a very complicated strategy game that you don’t just pick up. Second was that Polish is hard to read when you don’t know Polish. I looked at the little cards blankly, certain I would have had enough trouble with them in English – because some of them were in English. They hadn’t been able to wait for the Polish version of the expansion pack and bought their friend, owner of the game, the English version for his birthday. I hadn’t stepped into a casual get-together; I fell in among serious gamers who did this every week. About halfway through it hit me that Battlestar Galactica is a six player max game and there luckily happened to be five of them before I joined. I’d imposed myself on these poor people, forcing them to speak English out of politeness and slow down their game. The girl sitting next to me, Beata, kindly translated all of my cards; thankfully neither of us were Cylons. She also explained that Artefakt hosted game night every Tuesday and was, as I thought, a very cool place. According to this account by a fellow fan, it’s cool for a bunch of reaons, including travel slideshows on Mondays and interviews with authors. What an awesome place indeed. I felt lucky to have stumbled into it and, I wryly realized, landed among the Polish equivalents of my friends back home. Every table was crammed with people playing games and it didn’t begin to die down until after midnight, when the Cylons defeated us and we packed up. I thanked them for letting me play and I guess it wasn’t all a burden because they asked how long I was staying in Krakow. Unfortunately, I was leaving the next morning, catching a flight to Madrid, and a flight to Baltimore the day after. I was very much not ready to go, but at the least, it was a great last night out. In a funny but perhaps unsurprising follow-up, when I returned home and started exploring more of Baltimore, I found, in the half hipster half working class neighborhood of Hampden, a restaurant called Alchemy, and not far from that Baltimore’s most hipster café, which sat on a little side street and was named – wait for it – Artifact. There is no “Artifact” sign, but merely an “A” (scarlet, of course) hanging over the door. I only knew I was in the right place because it’s inside a renovated stone mill. The crowd it draws is far less pleasant than its Polish name twin’s, and how I would’ve rather played another game of Battlestar Galactica than listened to the petty problems within someone’s social circle. Maybe I will suggest a board game night to them.